Alternatively, the defendant’s motion as asks that the Court set aside the order due to the TVA’s failure to estimate and deposit just compensation for the actual taking. 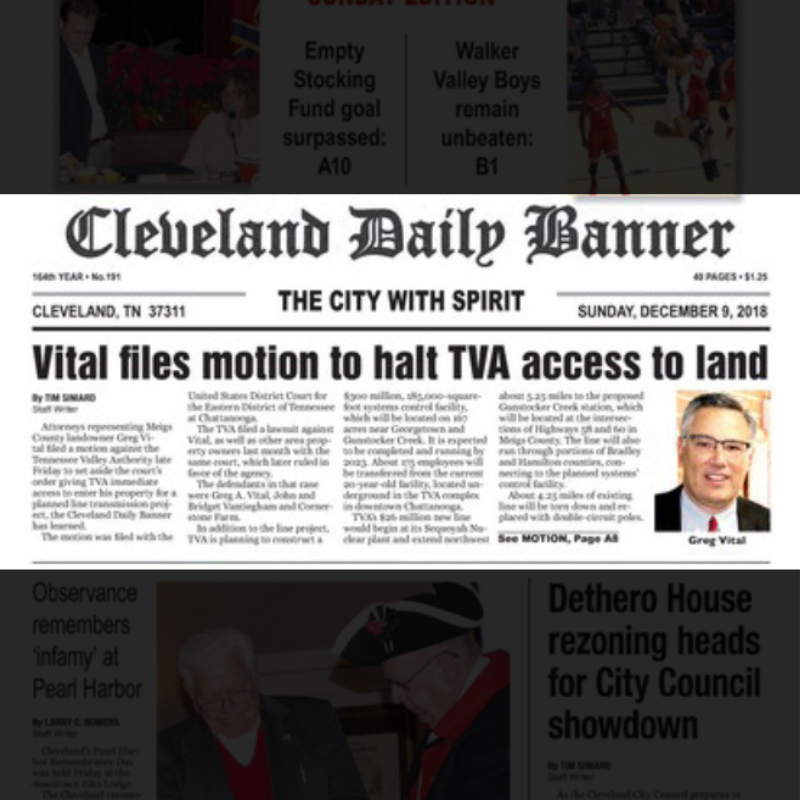 Lawyers for Vital contend the motion that the TVA filings are so broad that “TVA’s careless use of power has in this instance resulted—possibly inadvertently—in an actual taking which the TVA’s deposit of $1.00 in nominal compensation is inadequate.” Additionally, the motion says that the case has resulted “in an actual taking that is far more expansive than simply the right to enter onto private land to perform surveying activities. become all too comfortable with its power.” A fact supporting this view is that Vital has yet to be officially served with the Nov. 20 lawsuit. On Aug. 20, TVA announced publicly its plans for a major transmission line upgrade from Hopewell to Georgetown needed to power a “new secure office complex.” The $26 million plan included cutting a new, mile-long right of way through private property. There was no explanation of what the “secure office complex” was. It was the last time TVA communicated with Georgetown citizens. On Aug. 27, local media reported for the first time that TVA was moving its power control center and 175 employees out of downtown Chattanooga in what was a $300 million project. On Aug. 30, TVA held a public meeting in Georgetown and more than 150 people attended when TVA officials said the agency expected no more than 30. In September, TVA’s filed a permit with the Tennessee Department of Environment & Conservation to build a self-contained sewer plant on the site. The permit revealed that TVA had named initiative Project Viper and that the agency had been working on the project for two years. Vital met with TVA officials twice to discuss the routes of the transmission line and access to the property without any substantive concessions from TVA. On Nov. 20, TVA filed lawsuits against four property owners in four different Tennessee jurisdictions. On Nov. 30, TVA requested and was granted immediate access to the property.